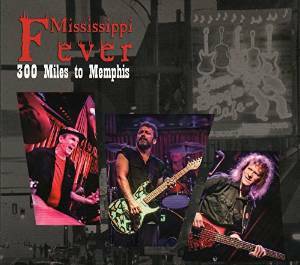 I just received the newest release, 300 Miles To Memphis, from Mississippi Fever and it's entertaining. Opening with funky, Feel Like Superman; guitarist, lead vocalist, Brent Barker kicks on the wah wah pedal and with supporting organ work from Steve Grimes; solid bass work from Ted May and tight drums from Tom May puts me in mind of a little Mahogany Rush. Very cool. A modern electric interpretation of Robert Johnson's Traveling Riverside Blues is up next and Barker takes a nice stretch on lead guitar actually bringing to mind Clapton's style. A real nice bass line by May is the trick on Steal Away Your Love. Barker's crisp acoustic guitar soloing on this track is a nice juxtaposition to the overall heavy feel of the track. One of my favorite tracks on the release, Downtown Train, has a real nice bass/drum bottom setting a solid platform for minimalistic vocal and guitar work by Barker. With the inclusion of a thin no nonsense guitar solo over absolute basics, I feel the track sounds a bit like early Black Keys which I feel is their best work. Till The Sunrise is an uptempo blues rocker sounding like a fusion of early Savoy Brown (vocals) and Robin Trower (rhythm). Again, a general stripped feeling brings the Keys into thought but this track has something special with super bass riffs from May. Another of my favorites is Black Dress with a real nice funky blues groove and a recurrent slick guitar riff. With it's warm melody and super groove this may be the breakout track for the release. Slow blues number Out All Night, has Tom and Ted May setting the stage for some of the most compelling vocal work on the release. Barker has a unique quality to his voice and paired with his guitar capabilities, they set this track on fire! Morganfield influenced and country styled, 300 Miles to Memphis has a acoustic picked flavor complimented nicely by Brandon Santini on harp. The Devil's Got You Now is a contemporary blues rocker which feels a lot like Savoy Brown from the early 70's. I happen to really like that band and this is a cool track with a cool rock beat and extended guitar soloing. What's not to like? Wrapping the release is ZZ Top's blues rock classic, Jesus Just Left Chicago. The basic arrangement on this track is mostly unchanged but Barker takes his guitar for a real nice walk throwing down some mighty licks and Rick Steff does a nice job on keys. Nice wrap to a fun release. That be some Greasy Blues!